Food for me is always an important aspect of the travel experience, but in Colombia it was a little extra special. I knew it would be important though even before I left home – Colombia is famous for its traditional cuisine and I couldn’t wait to try as much as possible. To truly understand local food cultures though you need help from locals, and I received that important assistance in a variety of ways. I traveled around Colombia with the travel company Monograms, and my Local Hosts at each stop along the way took the time to share with me their favorite foods and what makes them so special. I even managed to hop on a couple of food tours, ensuring I’d get to try as many different bites in the country as possible. I plan on writing a more comprehensive look at what makes traditional Colombian food so special, but first I want to share those food moments in the country that were my favorite. One of the most popular foods in Colombia, there are more than 32 different versions of arepas around the country. Like all great comfort foods, arepas are also incredibly simple. Made from a corn-based flour, these small disks of goodness are grilled and fried before being served. In Colombia they are filled with cheese and sometimes other ingredients depending on where you live. That’s actually why there are 32 different versions of the arepa, they vary not just from region to region, but even town to town. The cheese varies and in some places like Cartagena a boiled egg is even included. Many folks eat them as breakfast along with a cup of hot chocolate, but they’re sold and eaten throughout the day. I tried many of these easy to eat snacks in Colombia and when freshly cooked, they taste like the best grilled cheese you’ll ever have. Yes, the cheeses included and sizes of the arepas change, but it’s that combination of fried dough and cheese that has made it the insanely popular dish that it is today. In Colombia, most of the traditional foods are corn based, all variations on a theme really. That’s certainly true of the empanadas I tried in Colombia, but these filled pockets of dough are also common throughout South America. The Spanish brought them when they conquered and the convenient meal has since spread throughout the continent. How it is cooked and what’s included changes based on location and in Colombia that means a variety of ingredients, depending on the region. 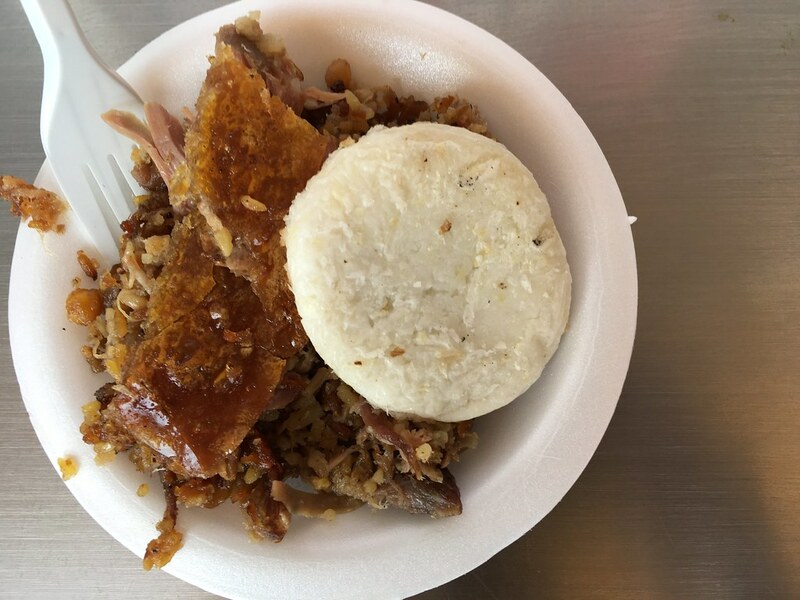 In Bogota, since it’s the capital, they had a variety offered almost everywhere but one of the most popular includes chicken, rice and a diced hard-boiled egg. Eating one as a lunch on the go, these fried treats are filling and make the perfect meal. Probably one of my favorite snacks in Colombia, it’s also one I had never heard of before. Said to have been created by Italian immigrants, these pop in your mouth bites are limited only by the imagination of their baker. Another corn-based food, the filling makes all the difference. Cheese is the most common and like the arepas are often dunked in hot chocolate, a curious but popular taste combination throughout the country. I also stopped at a stand in Bogota that sold dessert versions filled with guava or arequipe, a kind of milky caramel. When eaten still warm there’s nothing better and I quickly understood why some folks call them the Colombian bagel. It’s not all snacks of course and there are plenty of meals that are traditional throughout the country. There is no single national Colombian dish though. As with the more snacky foods, even the most popular meals vary dramatically throughout the country. Soups in Bogota are popular, if not incredibly hearty, but in the coffee growing regions these morph into stews with rice, meats with plenty of avocado on the side. In Cartagena the meals are heavily influenced by the city’s position on the Caribbean, so if you’ve traveled around the West Indies before these are flavors well known to you. No matter what you decide to try, try it you must. These traditional and more rustic meals, although different around the country, are at the heart of the Colombian food experience. Growing up watching those Juan Valdez commercials, I expected a lot from the coffee in Colombia and I certainly wasn’t disappointed. Traveling through the country’s coffee growing region, my Monograms Local Host took me to a coffee plantation in the heart of the region where I not only learned all about my favorite drink, but how to properly drink it as well. Set against hundreds of acres of rolling hills, the working farm was beautiful and the perfect first introduction to this remarkable area. Tasting the freshly produced coffee was the highlight though, but if you’re looking for a strong coffee then this isn’t the place for you. Here a more mild roast is preferred, a cup of coffee where you can taste the various flavors and nuances and in my opinion, makes for a better drinking experience than a burned-tasting cup of Joe. No matter where in Colombia you enjoy coffee, just make sure you do. It’s easy to find and the country makes some of the best in the world. Even before traveling to Colombia I knew that this popular dish was something I had to try, for the novelty if no other reason. Pairing cheese and hot chocolate doesn’t seem to make a whole lot of sense at first but believe me, there’s nothing else quite like it. To first sample this Colombian favorite, my Monograms Local Host took me to one of the oldest cafes in Bogota, the La Puerta Falsa. Serving up delicious sweets and light meals since 1816, this small establishment has the Chocolate Santafereño down to a science. Sitting there at the counter, the waiter brought the plate and I couldn’t wait to get started. A large cup of hot chocolate is surrounded by milky bread and cheese. It has to be a mild cheese though that won’t dissolve. Simply tear the cheese and bread, put them in the hot chocolate and start enjoying. The goal isn’t for the cheese to melt, but to get soft and the high-calorie combination was one of the best things I tried in Colombia. Walking through a large market in Bogota, my senses were nearly overwhelmed by the variety of items on display. Flowers, trinkets and of course food, all waiting to be bought and sold to local residents. Great food halls though also serve up at least a little prepared food, and in Bogota that meant enjoying a plate of lechon for lunch. Making lechon is a process. A whole pig is stuffed with rice, onions, peas and spices and is then slow cooked for 8-hours. The resulting mix of meat and other savory components is filling and delicious. The small cart at the market served directly from the pig, a little off-putting at first, but at least I knew it was fresh. As a port city, Cartagena is influenced by a variety of global cultures, but especially the Caribbean. Walking through the streets in the always-warm weather, the sounds and certainly the smells took me back to any number of islands I’ve visited. The food though is what clinched it, and one of my favorite Cartagena-specialties was the patacone. Also called tostones, these are plantain slices that are twice fried, pounded flat in between the two cookings to make it easier to eat. I enjoyed a few as a snack while wandering the largest market in Cartagena, but they’re also found throughout the day either with guacamole or just on the side during a meal. There’s no better way to embrace the flavors of the Caribbean though than with a couple patacones. Colombia’s food culture is rich and delicious and while I know I only tried just a few of the country’s many delicacies, what I did experience was better than I could have ever imagined.